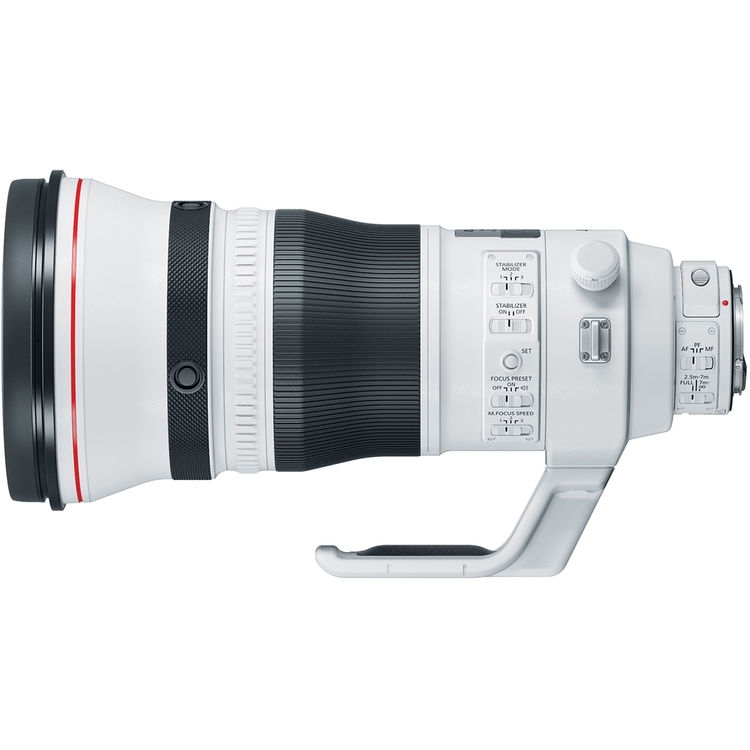 Pairing a favored super telephoto focal length with a bright f2.8 maximum aperture, the EF 400mm f2.8L IS III USM is a Canon L-series optic well-suited for outdoor, wildlife, and sports applications. This version III of this prized lens features a lighter weight design along with a sophisticated optical layout and updated handling capabilities. The fast maximum aperture enables extensive control over depth of field for isolating subjects using selective focus, and it also benefits working in difficult lighting conditions. Both Super UD and fluorite elements are used in the optical design to help reduce color fringing and chromatic aberrations for high clarity and color accuracy and a Super Spectra and Air Sphere Coatings have been applied to individual elements to suppress flare and ghosting for increased contrast and color neutrality when working in backlit conditions. Beyond the optical attributes, this 400mm f2.8 is also characterized by its advanced five stop-effective Image Stabilizer system, which has three separate stabilization modes to suit various shooting applications. Also complementing handling is a sophisticated ring-type USM, which provides quick, quiet, and accurate autofocus performance along with full-time manual focus override. A customizable electronic focusing ring further contributes to precise manual focus control, by affording three focusing sensitivity levels for different applications. Additionally, this lens is weather-sealed for use in trying environmental conditions and it has a removable rotating tripod collar to benefit working atop a tripod or monopod. - Super telephoto prime is designed for full-frame Canon EF-mount DSLRs, however can also be used with APS-C models where it provides a 640mm equivalent focal length. - Fast f2.8 maximum aperture benefits working in low-light conditions and also affords significant control over depth of field for working with selective focus techniques. - Super UD and fluorite elements are used to greatly reduce color fringing and chromatic aberrations in order to achieve greater clarity and color accuracy. - Super Spectra and Air Sphere Coatings have been applied to individual elements to control lens flare and ghosting for greater contrast and color fidelity when working in strong lighting conditions. - An Optical Image Stabilizer helps to minimize the appearance of camera shake by up to five shutter speed stops to better enable working in low-light conditions and with slower shutter speeds. Three distinct IS modes are available: standard single-shot mode, a panning-optimized mode, and a mode that only activates the Image Stabilizer during the exposure. - A ring-type Ultrasonic Motor (USM), along with optimized focusing algorithms and a high-speed CPU, is employed to deliver fast, precise, and quiet autofocus performance as well as full-time manual focus override. - Customizable electronic focusing ring provides three sensitivity levels for how quickly and precisely the lens can manually focus. - Focus Preset function is available to quickly recall a programmed focusing position. - Rounded nine-blade diaphragm contributes to a pleasing out of focus quality that benefits the use of shallow depth of field and selective focus techniques. - As a member of the esteemed L-series, this lens is sealed against dust and moisture for working in inclement environmental conditions and also features a fluorine coating on the front and rear elements to guard against water spots, smudges, or oil residue. - Removable rotating tripod collar is included and benefits working with the lens atop a tripod or monopod. - Compatible with optional EF 1.4X and EF 2X teleconverters.